I was inspired to start a Chinese thread after watching a Ted Talk video about learning to read Chinese. However, I prefer to start with phonetics, so I'll do so. Radicals would be a good topic to have too later on. As you may know, Chinese uses a character-based writing system, and thus may seem to have no apparent alphabet. However, Chinese has something similar to Japanese hiragana, called æ³¨éŸ³ (zhÃ¹yÄ«n), literally "phonetic", or "note"+"sound", which is a set of symbols representing phonetics. There is also a corresponding westernized equivalent called æ‹¼éŸ³ (pÄ«nyÄ«n), literally "alphabetic", or "spell"+"sound". The bolded letters, "pÄ«nyÄ«n" is already an example of how pÄ«nyÄ«n is used and looks like . Note however that these are only used as pronunciation guides, and are never used to replace formal characters in writing. As such, there is generally no need to learn zhÃ¹yÄ«n, since pÄ«nyÄ«n was created as a one-is-to-one replacement for zhÃ¹yÄ«n to make it easier for westerners to learn Mandarin. Most online sites, including Google translate also use pÄ«nyÄ«n to show the pronunciation. The Chinese "alphabet" has 21 consonants (initials) and 16 vowels (finals). There are also 4(+1) tones, which will be discussed later. Below are the æ³¨éŸ³ zhÃ¹yÄ«n symbols with their corresponding æ‹¼éŸ³ pÄ«nyÄ«n equivalents. Except for ã„�ã„‘ã„’ (which are pronounced with a long "ee" sound), all other consonants are pronounced by themselves with a very short "uh" sound, as if just sounding out the consonant sound in English. Note also that there are many pairs of unaspirated and aspirated consonants. When pronouncing unaspirated consonants, you should feel no air coming from your mouth if you hold your palm in front of it, while the opposite is true for aspirated consonants. Chinese actually has no "b", "d" and "g" sounds, however these letters are used in pÄ«nyÄ«n to represent the unaspirated "p", "t" and "k" sounds respectively. Finally, there are three sets of consonants with similar initial sounds: ã„�ã„‘ã„’, pronounced with an "ee" sound; ã„“ã„”ã„•, pronounced with an "h" consonant cluster; and ã„—ã„˜ã„™, with the plain consonant sounds. As with the consonants, there are also three sets of vowels with similar vowel sounds: ã„šã„œ, which are the plain vowel sounds; ã„¢ã„£, pronounced with a final "n" sound; and ã„¤ã„¥, prnounced with a final "ng" sound. Chinese has four tones, plus a fifth neutral tone, which is usually used for sentence-final particles like å—Ž Simplified: å�—(ma), å�§ (ba) and å‘¢ (ne), or repeated characters like çˆ¸çˆ¸ (bÃ ba) or åª½åª½ Simplified: å¦ˆå¦ˆ (mÄ�ma) Since it's a neutral tone, there is no tonal mark used in pÄ«nyÄ«n. However, in zhÃ¹yÄ«n, the fifth tone is represented by a dot above the consonant. ç¬¬ä¸€è�² Simplified: ç¬¬ä¸€å£° (dÃ¬ yÄ« shÄ“ng) First tone: This is pronounced like a monotone sound. No tonal mark is used for zhÃ¹yÄ«n, while a horizontal line is used in pÄ«nyÄ«n, such as in å·´ (bÄ�). ç¬¬äºŒè�² Simplified: ç¬¬äºŒå£° (dÃ¬ Ã¨r shÄ“ng) Second tone: This is pronounced with a short upward inflection, somewhat like when asking "huh?" The tonal symbol for both for zhÃ¹yÄ«n and pÄ«nyÄ«n is an upward flick, such as in æ‹” (bÃ¡). ç¬¬ä¸‰è�² Simplified: ç¬¬ä¸‰å£° (dÃ¬ sÄ�n shÄ“ng) Third tone: This is pronounced with a deep and gentle downward dip followed by a very subtle upward inflection, which is often dropped. The tonal symbol for both zhÃ¹yÄ«n and pÄ«nyÄ«n is a checkmark, such as in æŠŠ (bÇŽ). ç¬¬å››è�² Simplified: ç¬¬å››å£° (dÃ¬ sÃ¬ shÄ“ng) Fourth tone: This is pronounced with a quicker downward tone, as if angry. The tonal symbol for both zhÃ¹yÄ«n and pÄ«nyÄ«n is a downward mark, such as in çˆ¸ (bÃ ). Tones are often practiced by repeating the same syllable in each of the four tones : bÄ� bÃ¡ bÇŽ bÃ . pÄ� pÃ¡ pÇŽ pÃ . mÄ� mÃ¡ mÇŽ mÃ . fÄ� fÃ¡ fÇŽ fÃ . Each Chinese character is composed of exactly one syllable. Some words are composed of two or more characters, and in pÄ«nyÄ«n, all syllables of the word are written together with no space. There is no confusion where each syllable begins and ends because of the specific combinations of phonetics allowed. Each syllable is composed of 0 or 1 consonant followed by 0-2 vowels, with at least one zhÃ¹yÄ«n. The corresponding pÄ«nyÄ«n is always spelled with at least one English vowel. ZhÃ¹yÄ«n is written vertically with the consonant on top and the vowel/s at the bottom, usually on the right of the character it represents. PÄ«nyÄ«n is written from left to right, usually below or next to the character. Each syllable has a tone. In zhÃ¹yÄ«n, the tone symbol is always written at the upper right of the last vowel of the syllable, or above the consonant if there are no vowels. For pÄ«nyÄ«n, the tone symbol is written above the first English vowel of the last phonetic part of the syllable (For example, in the syllable ã„�ã„§ã„ (jiÄ�o), the tonal symbol is written above the "a", which is the first English vowel of the last phonetic sound ã„ (ao). For a full list of phonetic combinations, along with the pronunciations in different tones, here is a source at echineselearning.com. Most of the consonants must be paired with at least one vowel to form the phonetics of an actual word. Only the last 7 consonants can stand alone in a syllable. When spelled alone in pÄ«nyÄ«n, the letter "i" is added to the end of the syllable: ã„“(zhi) jã„”(chi) ã„•(shi) ã„–(ri) ã„—(zi) ã„˜(ci) ã„™(si), and the tonal mark is above the "i". The pronunciation remains the same with the super short "uh" sound. There is no confusion since these consonants never appear before the ã„§(yi) phonetic. All vowels can stand alone, except for ã„� and ã„Ÿ. Vowels may also come in pairs, but only ã„§(yi) ã„¨(wu) ã„©(yÃ¼) can be the first in a two-vowel combination. When this happens, the pronunciation may change accordingly. For example, the syllable ã„…ã„§ã„¢(b + yi + an = bian) is pronounced with a short "ie" sound, like in the Spanish "bien", but quicker as one syllable. On the other hand, the syllable ã„…ã„§ã„£(b + yi + en = bin) is pronounced with a short "i" as "pin". In the above example, the pÄ«nyÄ«n of ã„…ã„§ã„£ is spelled as "bin" instead of "bien". This is a special rule for the combinations ã„§ã„£(yi + en = yin) and ã„§ã„¥(yi + eng = ying). In this case, the final "e" is dropped, and the "i" remains. A similar rule applies with the ã„¨ã„£ combination, unless there is no consonant in the syllable. That is, ã„¨ã„£(wu + en = wen), but ã„‰ã„¨ã„£(du + en = dun). The ã„¨ã„¥(wu + eng = weng) combination is never found after a consonant. When the syllable has no consonant and ã„§(yi) or ã„¨(wu) are combined with another vowel (with the exceptions of ã„§ã„£, ã„§ã„¥, and consonant+ã„¨ã„£ special cases above), the "i" or "u" is dropped. For example, ã„§ã„¢ (yi + an = yan), and ã„¨ã„›(wu + o = wo). For vowel combinations ã„§ã„¡ (yi + ou = you) and ã„¨ã„Ÿ (wu + ei = wei) when followed by a consonant, the first letter of the last phonetic is dropped instead. For example, ã„‰ã„§ã„¡ (d + yi + ou = diu) and ã„‰ã„¨ã„Ÿ (d + wu + ei = dui). When not preceded by a consonant, or when ã„©(yÃ¼) comes after ã„�(j) ã„‘(q) or ã„’(x), the dots above the "Ã¼" are dropped. This is because ã„œ(u) and ã„¨(wu) can never come after ã„§(yi), ã„�(j) ã„‘(q) or ã„’(x), so there will be no confusion. So I think I've covered most of it. If I missed anything, or if you have better examples or questions, feel free to add or ask! Corrected and added some notes for the pronunciation of the last three vowels ã„§ã„¨ã„©, and corrected all the misspellings of "pronounciation"
Added pÄ«nyÄ«n rule for ã„§ã„¡ and ã„¨ã„Ÿ combinations when follwed by a consonant in the syllable, and added change log. I didn't know that Chinese had a phonetic alphabet! Thank you for the info! In in! I just started learning Chinese recently. I've seen this phonetic, I want to learn it - but I think I'll go with pinyin because my textbook uses it. I've been a bit slow in my lessons lately because I'm working a 50 hour week & riding my bike 45 minutes each way - so I'm taaaard. But I'm keeping up with it in small steps. You're welcome I figured most people wouldn't know, but I thought it would be useful to see where the romanization comes from, so that's why I chose this for the first lesson. Welcome! I do plan to stick with pÄ«nyÄ«n in this thread, since it's more commonly used now and easier to type. However just make sure to read it in the Chinese way and not the English way I sometimes convert the pÄ«nyÄ«n back to zhÃ¹yÄ«n in my head to avoid doing that, especially for the "zh", "z" and "c" sounds. And also the "-i" after stand-alone consonants. As you may have noticed in the previous lesson, some of the characters have the comment "Simplified:" next to them, with a different, but somewhat similar character. This is because Chinese has two writing systems, namely ç¹�é«” (fÃ¡ntÇ�), literally "complicated form", or Traditional, and ç®€ä½“ (jiÇŽntÇ�), literally "simplified form", or simply Simplified. And yes, "é«”" (tÇ�) and "ä½“" (tÇ�) are exactly the same word, but written in the two different forms. In the olden days, there was only the Traditional form. An interesting thing about written Chinese is that despite the different variations or dialects, they are written the same. Thus people from different regions could understand each other through writing, despite the characters being pronounced completely differently in each variation (all phonetics in this thread are for Mandarin, unless otherwise specified). At some point, Simplified Chinese was developed in an attempt to improve literacy, basically simplifying the strokes of more complex characters, and sometimes merging two similar characters into one, so that fewer characters would have to be learned. Simplified, then, looks less intimidating, especially to new learners. As an effect, it becomes easier to write and to read, especially when typed with smaller fonts. However, this simplification also comes with a downside, the main one is that the meaning of the word is sometimes lost. The traditional form contains the word å¿ƒ (xÄ«n), which means "heart". This is completely lost in the Simplified form. I have no idea why they designed it this way. 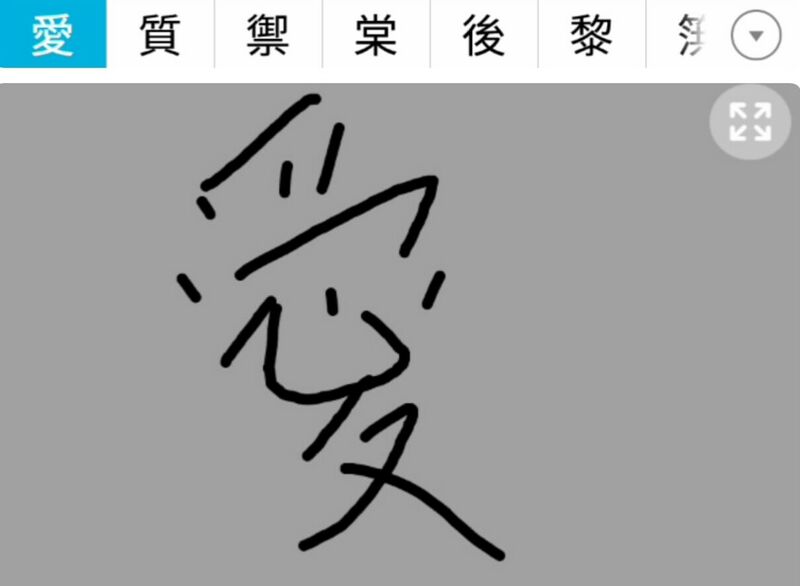 Apparently å¿ƒ is more difficult to write when part of a more complex character? The Epoch Times gives some more examples of loss of meaning. Anyway a good thing is that a lot of the simplifications are done in logical patterns. For example, the character èªª (shuÅ�) meaning "to say" is simplified to è¯´. Whenever you see the root è¨€ (yÃ¡n), or "word", in a traditional character, it will always be simplified in the same way (though interestingly enough, "è¨€" itself is still retained as "è¨€"). In the Simplified version, the å�£ (kÇ’u) or "mouth" is gone. However if you're familiar with this pattern, you would be able to associate it for other words. Traditional form: èªªè©± (shuÅ�huÃ ), meaning "to speak"
Simplified form: è¯´è¯� (shuÅ�huÃ ), meaning "to speak"
Traditional form: è«‹ (qÇ�ng), saying "please"
Simplified form: è¯· (qÇ�ng), saying "please"
Traditional form: è¬�è¬� (xiÃ¨xie), meaning "thanks"
Simplified form: è°¢è°¢ (xiÃ¨xie), meaning "thanks"
Personally I prefer Traditional Chinese, because that was what I learned. My first reaction to Simplfied Chinese was disappointment, and somewhat disgust, feeling that it was not "real" Chinese. However, I recognize its growing use and plan to include the Simplified version for all lessons, so it won't be necessary to learn both, and you can stick with the form you prefer or are already learning. While I didn't explicitly learn Simplified Chinese, many of the characters are the same, or similar enough to Traditional form to decipher easily. For those completely different characters, it's easy enough to become familiar with them through exposure, especially if they are common words. (And if they're not, then they won't come up much ). Simplified Chinese seems to be more common these days, especially online. 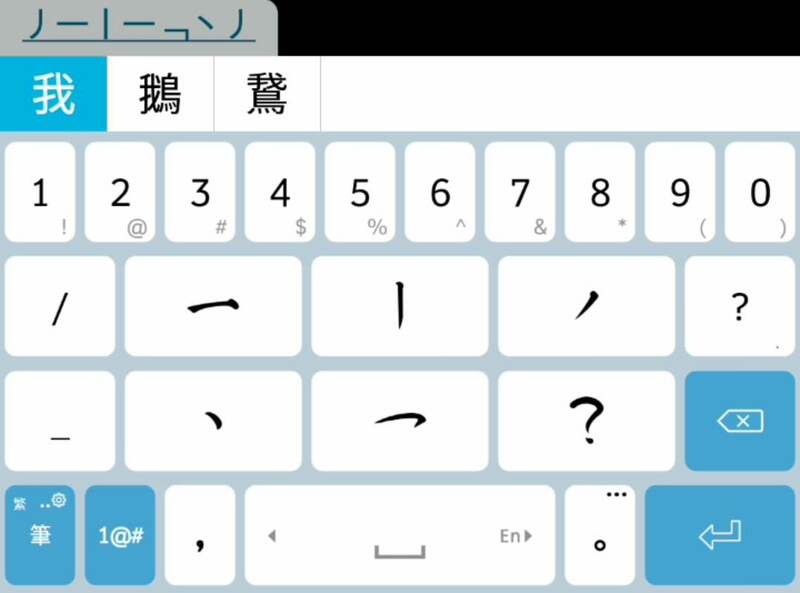 Some of my classmates who are native Chinese speakers (and learned Traditional form) use Simplified form to type, probably because it's the default setting on their phones. The Duolingo Chinese course also uses Simplified form, but still accepts Traditional Chinese characters if you choose to use that when typing out answers. There are many different ways to type Chinese characters! 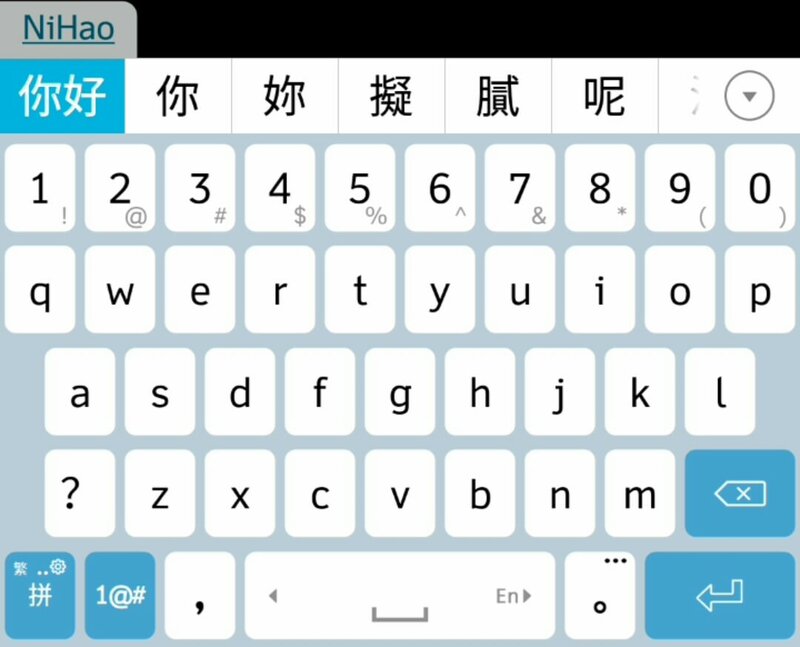 You can type using phonetics, stroke order, roots, or even by manually writing the character on your screen. Having different input methods is useful for when you have only partial familiarity with the character you wish to type. Below are some of the common input methods, available for both Simplified and Traditional Chinese. 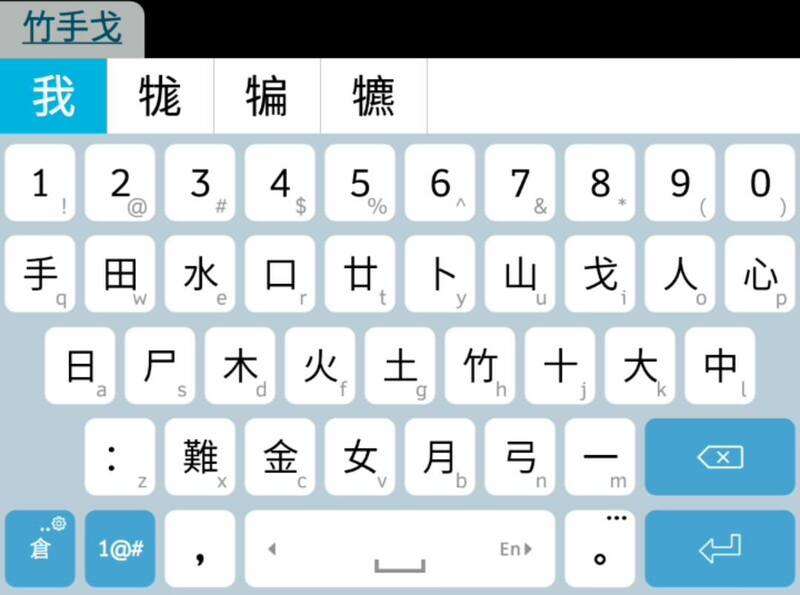 If you know the phonetics of a word, you can type Chinese using a ZhÃ¹yÄ«n (æ³¨) or a PÄ«nyÄ«n (æ‹¼) keyboard. Simply type the phonetics in order, and choose the appropriate character among the choices that appear (like with auto predicting text). In older versions, you will also need to indicate the tone, but this is not necessary for newer versions. You don't have to know exactly how to write the word, but you do need to have enough familiarity to choose the correct character from the list. As with other autopredict systems, the most common characters or phrases appear first, and may appear even before typing the entire phonetic. In newer versions like the one in the screenshot, there is also no need to stop to choose each character individually. Below is the sample of typing the common greeting ä½ å¥½ (NÇ� hÇŽo), literally "you" + "good"
*Note: As there's no "Ã¼" on the keyboard, letter "v" is used instead, since it's the only English letter not used in pÄ«nyÄ«n. If you don't know how a character is pronounced, but know how to write it, you can use the BÇ�huÃ , or Stroke Count Method, usually marked with the symbol ç­† (for traditional) or ç¬” (for simplified). Writing in Chinese follows a specific stroke order, and one limitation for this method is that the stroke order must be correct. So you really need to know how to write the character, and not just how it looks like. However, as with other auto predictive text, it's usually not necessary to go through the entire stroke sequence for the desired character to appear as a suggestion. Another alternate system is the CÄ�ngjiÃ© Input Method, marked with the symbol å€‰, and normally used with Traditional Chinese. As with the BÇ�huÃ method, you don't need to know how the character is pronounced, but you do need to know character composition before you can use this system. Some dictionaries or online sites like wiktionary include the character's CÄ�ngjiÃ© code. Below is a sample typing the same character æˆ‘ (wÇ’), which has the CÄ�ngjiÃ© code ç«¹æ‰‹æˆˆ or HQI on the qwerty layout. 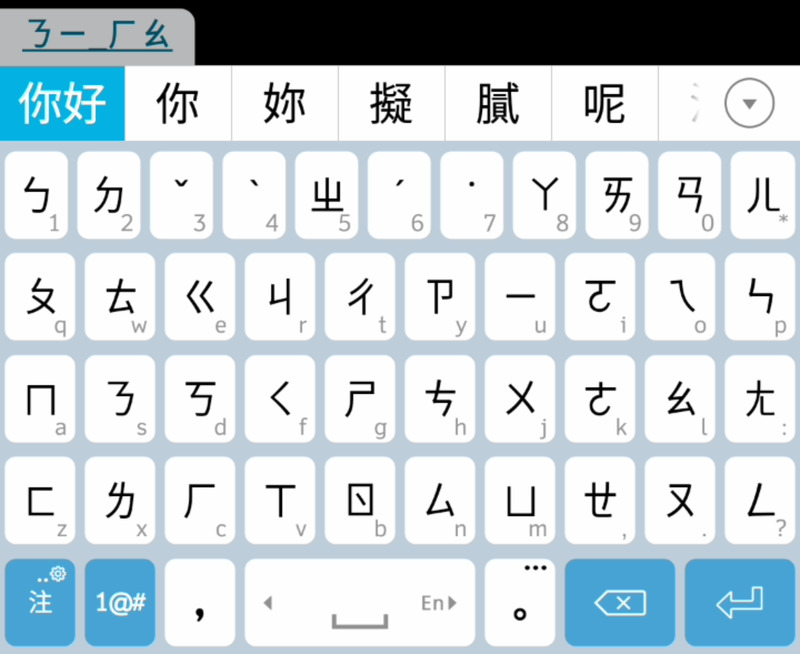 As the name implies, this input method allows for free-hand writing of the Chinese character. 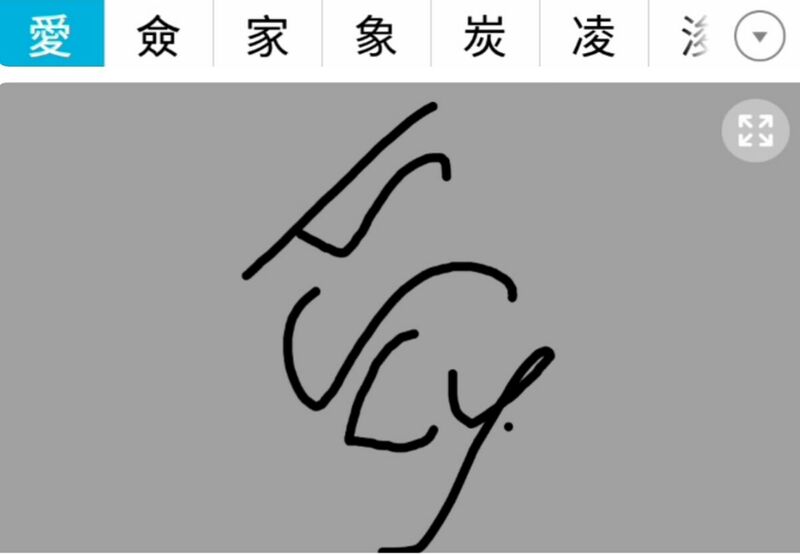 Below is a sample writing the word æ„› Simplified çˆ± (Ã i) meaning "love". Note that the handwriting doesn't have to accurately match the character, and proper order of strokes doesn't have to be followed. For example, the writing below, which looks pretty much nothing like the character æ„›, is still recognized well enough. Also, although the keyboard setting is to Traditional form, writing in Simplified form would still be recognized, and I assume this is true vice versa as well. While you don't have to know the correct stroke order, it would still help to be able to write the character quickly. A downside is that writing too slow would stop recognizing the succeeding strokes as still part of one character. Also, each character needs to be written one by one. Added note on letter "v" under the pinyin input method. Chinese is relatively easy in terms of grammar and sentence construction. There are no cases, no conjugation, no plural forms, no verb tenses, no articles. There is just the basic Subject - Verb - Object. Once you build your vocabulary, it will be pretty straightforward to form sentences. So let's start with personal pronouns, since these will be used in most basic sentences. Chinese pronouns are very simple, with no grammatical cases. Let's start with singular pronouns. All of these are written the same in Traditional and Simplified form. Note that there are two words for "you", which is also common in other languages. ä½ (nÇ�) is the informal form, while æ‚¨ (nÃ­n) is the polite form, used for example with elders. Click the spoiler below for the lesson in Traditional Chinese. Click the spoiler below for the lesson in Simplified Chinese. Click the spoiler below for Traditional Chinese. Click the spoiler below for Simplified Chinese. å®¶ (jiÄ�) ~you may recognize it from the phrase å¤§å®¶ (dÃ jiÄ�), literally "big" + "house", or "everyone"
For brief overview of the character, it is composed of a roof symbol å®€ housing the character for pig è±• ðŸ�–. This is from ancient times when people used to live under the same roof with livestock. Now without further ado, let's introduce our family! Note that Chinese uses a measure word å€‹ Simplified: ä¸ª (gÃ¨) to indicate the number of people. For now, just remember to always add this when talking about how many people there are. Females also generally have the radical å¥³ (nÇš), meaning "woman" on the left part of the character. If you have more than ten members in your family, no worries! Numbers are easy in Chinese once you can count to ten, and this will be the next lesson. Here are some more examples! ä½ æœ‰å¹¾å€‹å¼Ÿå¼Ÿï¼Ÿæˆ‘æœ‰å…©å€‹å¼Ÿå¼Ÿã€‚ (NÇ� yÇ’u jÇ� gÃ¨ dÃ¬di? WÇ’ yÇ’u liÇŽng gÃ¨ dÃ¬di.) How many younger brothers do you have? I have two younger brothers. ä½ çš„å¦¹å¦¹æ˜¯æˆ‘çš„æœ‹å�‹ã€‚(NÇ� de mÃ¨imei shÃ¬ wÇ’ de pÃ©ngyÇ’u.) Your younger sister is my friend. ä»–èª�è­˜æˆ‘çš„å§�å¦¹ã€‚(TÄ� rÃ¨nshÃ¬ wÇ’ de jiÄ›mÃ¨i.) He knows (is acquainted with) my sisters. å“¥å“¥ï¼Œä¾†å�ƒå�§ï¼�(GÄ“gÄ“, lÃ¡i chÄ« ba!) Gege, come eat! æˆ‘æ²¡æœ‰å…„å¼Ÿå§�å¦¹ã€‚(WÇ’ mÃ©iyÇ’u xiÅ�ngdÃ¬ jiÄ›mÃ¨i.) I don't have siblings. ä½ æœ‰å‡ ä¸ªå¼Ÿå¼Ÿï¼Ÿæˆ‘æœ‰ä¸¤ä¸ªå¼Ÿå¼Ÿã€‚ (NÇ� yÇ’u jÇ� gÃ¨ dÃ¬di? WÇ’ yÇ’u liÇŽng gÃ¨ dÃ¬di.) How many younger brothers do you have? I have two younger brothers. ä½ çš„å¦¹å¦¹æ˜¯æˆ‘çš„æœ‹å�‹ã€‚ (NÇ� de mÃ¨imei shÃ¬ wÇ’ de pÃ©ngyÇ’u.) Your younger sister is my friend. ä»–è®¤è¯†æˆ‘çš„å§�å¦¹ã€‚ (TÄ� rÃ¨nshÃ¬ wÇ’ de jiÄ›mÃ¨i.) He knows (is acquainted with) my sisters. å“¥å“¥ï¼Œæ�¥å�ƒå�§ï¼� (GÄ“gÄ“, lÃ¡i chÄ« ba!) Gege, come eat! æˆ‘æ²¡æœ‰å…„å¼Ÿå§�å¦¹ã€‚ (WÇ’ mÃ©iyÇ’u xiÅ�ngdÃ¬ jiÄ›mÃ¨i.) I don't have siblings. I will never learn Chinese but I love the symbols and explanations. For this lesson, let's learn to count in Chinese! æ•¸ Simplified: æ•° (shÃ¹) is the Chinese word for "number". When pronounced with the third tone (shÇ”), the same character means "to count". And when combined with the word for "learn" or "study", æ•¸ å­¸ Simplified: æ•°å­¦ (shÃ¹xuÃ©) is the term for "Mathematics". Chinese numbers work similarly to Arabic numerals in the decimal system. That is, to get 11, we just put together 10 and 1, or å��ä¸€ (shÃ­yÄ«). How do you think we would write 15? To get 20, we put 2 and 10 together, that is äºŒå�� (Ã¨rshÃ­). To get 21, that's 2 10's and 1, or äºŒå��ä¸€ (Ã¨rshÃ­yÄ«). With this system, you can easily count to 99! I was considering typing out all the numbers to completely illustrate, but I'll just link to this post from https://blogs.transparent.com instead, which goes all the way to 100, ä¸€ç™¾ (yÃ¬bÇŽi), and even throws in the number zero, é›¶ (lÃ­ng) for no extra charge! . . _1,000 = 1 "thousand"
. . .10,000 = 10 "thousands"
. _100,000 = 100 "thousands"
In Chinese, large numbers are grouped by every "ten thousands" or 萬 / 万 (wàn), with a new term for every ten thousand "ten thousands". 10,000^1 = 萬 (wàn) "ten thousand"
10,000^2 = 億 (yì) "hundred million"
10,000^3 = 兆 (zhào) "trillion"
. . . . . . . . _ 1,000 = 一千 (yīqiān) 1 "thousand"
. . . . . . . . 10,000 = 一萬 (yīwàn) 1 "ten thousands"
. . . . . . . _100,000 = 十萬 (shíwàn) 10 "ten thousands"
. . . . . . .1,000,000 = 一百萬 (yībǎi wàn) 100 "ten thousands"
. . . . . _10,000,000 = 一千萬 (yīqiān wàn) 1,000 "ten thousands"
. . . _ 100,000,000 = 一億 (yīyì) 1 "hundred million" = 10,000 "ten thousands"
. . . _1,000,000,000 = 十億 (shíyì) 10 "hundred millions"
. _ _10,000,000,000 = 一百億 (yībǎi yì) 100 "hundred millions"
. ._100,000,000,000 = 一千億 (yīqiān yì) 1,000 "hundred millions"
1,000,000,000,000 = 一兆 (yīzhào) 1 "trillion" = 10,000 "hundred millions"
10,000^1 = 万 (wàn) "ten thousand"
10,000^2 = 亿; (yì) "hundred million"
. . . . . . . . 10,000 = 一万 (yīwàn) 1 "ten thousands"
. . . . . . . _100,000 = 十万 (shíwàn) 10 "ten thousands"
. . . . . . .1,000,000 = 一百万 (yībǎi wàn) 100 "ten thousands"
. . . . . _10,000,000 = 一千万 (yīqiān wàn) 1,000 "ten thousands"
. . . _ 100,000,000 = 一亿; (yīyì) 1 "hundred million" = 10,000 "ten thousands"
. . . _1,000,000,000 = 十亿; (shíyì) 10 "hundred millions"
. _ _10,000,000,000 = 一百亿; (yībǎi yì) 100 "hundred millions"
. ._100,000,000,000 = 一千亿; (yīqiān yì) 1,000 "hundred millions"
Click the spoiler below for the Traditional Chinese.